Happy Thursday Everyone! Did this week fly by, or is it just me?? 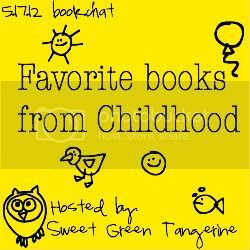 Today I am linking up with Sweet Green Tangerine to share some of my favorite childhood books! This book is so cute and the illustrations are phenomenal! Looking back, "The Giving Tree" is definitely a favorite of mine! The Giving Tree actually caused a lot of controversy, because some readers believe that the boy is selfish in his demands from the tree, but most believe that this story can be viewed as a comparison between a parent and child....I think it's a cute book! My parents used to read me this book- "Five Minutes' Peace" by Jill Murphy. The book is basically about a mama elephant who wants Five Minutes' Peace from her Children...Ironic that my parents used to read this to me?...I think not! ....and who could forget the lovely Amelia Bedelia series about a clumsy maid that can't seem to do anything correctly. Who didn't love a good Goosebumps book?? I'm also pretty sure I read ALL of The Baby-Sitters Club books! Who wants to hear a traumatizing childhood story of mine?? In elementary school, we used to take a class trip down to the library once a week and we all got to pick out a book to bring home. We had a nasty, scary librarian at the elementary school that all of the kids were petrified of and if you forgot to bring your book back the next week, you had to sit at the "bad kids table" and you weren't allowed to take a book out until you brought the book back! Well, being the shy, grade school student that I was, I didn't argue and sat at the "bad kids table" for a MONTH!! A MONTH! People!! Do you know how awful it is watching your friends pick out fun, new chapter books every week, while you get nothing!? "Kristen, you can take out a book today...I found the book hidden on my desk"
"The Very Hungry Caterpillar". YES!!! Love. I loved Amelia Bedelia and The babysitters club! How did you remember all those books? I tried thinking of some and only came up with 2! That was a traumatizing story! What a mean librarian. Also, I LOVE ERIC CARLE. We watched a really cool video of how he did his illustrations when I was in second grade, and we also read another of his books that had two pages taped together. I was curious, so I opened them later when the teacher wasn't looking and it was NAKED PEOPLE. I think it was Adam and Eve haha. We were so sheltered. I loved the The Very Hungry Catepillar and the Elephant book and Amelia Bedelia AND Full House. This post just gave me warm fuzzies! Loved Amelia Bedelia! She was so fun growing up & I think I love her even more now that I'm older. I'm laughing out loud at JUST HOW MANY OF US mentioned Babysitter's Club this week. Awesome lol!! Your current read is my current read, too. And I'll always love that caterpillar.